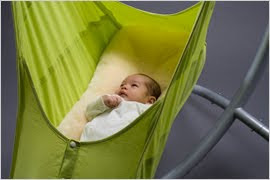 This cradle and hammock called Hushamok is an absolute novelty in the world, as its rocking motion soothes babies, allowing them to feel in the belly of the mother and avoiding even changes as infantile colic, among others. The cradle and hammock Hushamok was created by a couple originally from New Zealand. Apparently, these parents suffered much to see her son with frequent cramps and designed this cradle-Hammock 100% organic cotton. The cradle and hammock Hushamok consists of a foot or ultra-rugged metal bracket. In this bracket hangs the cradle, made of pure cotton preventing allergies in infants. 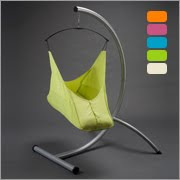 The part of the cradle itself is available in several colors, including oil, pink, orange, green and blue.